Glass cockpit training better prepares you for your career with the airlines and puts ahead of the other candidates. Today, some flight schools are equipped with “glass cockpit” training aircraft, while others are not. At Genesis Flight College, we are proud to offer glass cockpit training to our students in Collingwood, Ontario because we believe that this method of flight training offers the student the best possible entry into the airlines. For career oriented students the ultimate benefit of glass cockpit training is that it better prepares you to become a pilot for a major airline. Many airlines now prefer to hire pilots who have prior experience with Electronic Flight Information Systems (EFIS), and they are more willing to employ pilots who have used advanced aircraft. Additionally, if you train in a glass cockpit from the early stages, making the transition to IFR (instrument flight) instruction is often much simpler. 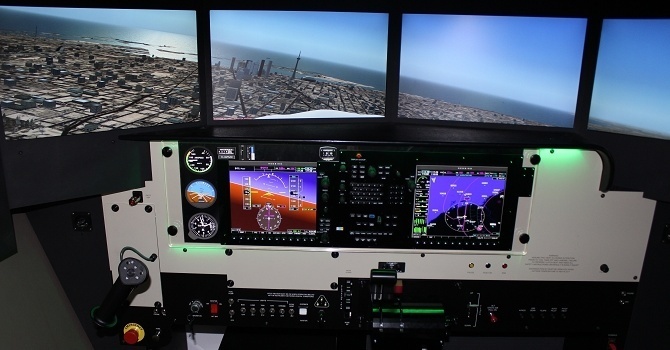 If you would like to know more about glass cockpit training and why it should be an essential component of your training, please contact us at Genesis Flight College today. We are eager to open up your eyes to the thrill of flying with our selection of flight training options. IFR RENEWAL PACKAGE: $649* – ALL INCLUSIVE Package includes: 2.0 hours of dual IFR instruction in our Redbird full motion simulator 1.0 hour of ground time with one of our IFR flight instructors IFR renewal ride in the Redbird IFR examiner fee included Transport Canada rating fee included Comfortable and professional environment * $649.00 plus HST. Any study materials will be at an additional cost. For any additional FTD or ground training, the student will be billed at the current rates for equipment and instructor.